Dogs and handlers must excel in canine obedience. This is the first step in becoming a team. After mastering obedience training, teams must provide documentation of a current therapy dog certification with another recognized therapy dog organization (e.g. Alliance of Therapy Dogs, Delta) OR complete the Canine Good Citizen Assessment (CGC) with a recognized evaluator. If you do not have a CGC evaluator in your community, contact paws-in-hand@hotmail.com to arrange an evaluation. Evaluation fees are the responsibility of the handler. Once the CGC is passed or an alternate therapy dog certification is documented, NOAH’s therapy dog teams must complete an online or face-to-face training workshop with NOAH’s. A one-time workshop fee will apply. 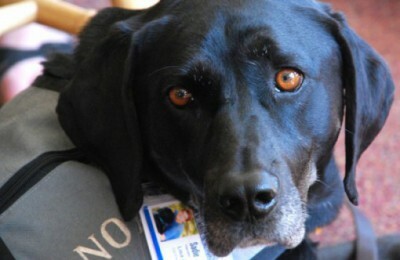 Credentials issued represent the knowledge and abilities of the handler and the dog at the time of issuance. In order to join the crisis team, dogs and handlers must complete a second online or face-to-face training or have documented training in psychological first aid or crisis mental health care in addition to at least one year of documented therapy dog visits with NOAH’s or another therapy dog organization. Handlers must also agree to complete incident command systems training during the first year of membership. Dogs must be a minimum of one year old to be evaluated. The dog must be healthy. Current veterinary records must be submitted to the NOAH’s evaluator. The handler must be of good character and able to pass a background check. Therapy and crisis team members must maintain records of hospital, nursing home, school, church, and other visits. Teams must abide by the rules and regulations of the facilities and sites they visit. Crisis team members must agree to participate in periodic trainings in psychological first aid and crisis mental health, incident command systems, HIPPA, and dog handling in disasters. Handlers own and are legally responsible for their dogs and for carrying insurance appropriate to their therapy or crisis intervention activities.